These days, there are plenty of spy and surveillance toys for the adult spy, and I’m going to tell you about some of them. Hidden cameras come in all sizes and shapes.You should choose one based on the location and reason for the surveillance. From a bedroom inside your house to your car to watching over your backyard, there's a small hidden camera to fit your needs. Many people wonder what goes on in their home when they’re not around…Is your husband or wife cheating? Are you kids having friends over? Is your babysitter ignoring or mistreating your child? Is the repairman or contractor doing his job or is he just watching your TV? Is a family member stealing money from your hidden stash? Is your cleaning lady stealing from you? Is one of your guests snooping in your bedroom? Setting up a wireless home surveillance system may sound intimidating or hard to do, but many systems today are very easy to use. It may be something simple like a hidden camera alarm clock or a hidden camera smoke detector to a system where each room is monitored, along with cameras outside. A hidden spy camera may be discreet and hidden or it may be out in plain view so everyone knows what’s going on. This particular one is one you can actually wear, instead of leaving it on a shelf in you house. It's a mini spy video camera with audio. Yes, you'll be able to hear everything that goes on. Many hidden cameras don't have this feature due to government regulations. Built to look like a stick or thumb drive, this mini hidden camera will fit into your pocket or purse, and has a built-in DVR. The pocket clip allows you to attach it to your jacket or shirt pocket, or a purse strap, whatever, for hands free recording. Just the push of a button to activate it and you're recording. When you're done, connect it to a USB port on your computer to watch & listen. 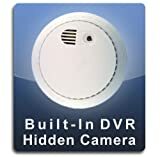 Many of the hidden cameras with built-in DVR's are very easy to use. Most have instructions to record and then connect to your computer with no wires, cords or complicated instructions. This is so just about anyone can spy. You don't need to be a techie to do it. There are so many spy hidden video camerasout there that can be used seriously for business or just for fun. Many of these are very affordable, some are equipped with audio and most can be played back on your computer with the right equipment. Become a kid again and go get a mini spy video camera. Who Wants to Be Like James Bond? Fun and useful gadgets, many of them bargains, that make great birthday or Christmas gifts for the geeks and frequent travelers in your life. Gadgets boost productivity, enhance creativity, help organize and provide fun and relaxation. Gadgets are great gifts for writers, office workers, stay-at-home moms and travelers. Who says waking up in morning has to be unpleasant? These alarm clocks can make even the groggiest person smile when being dragged out of bed.